This is another recipe from my new cookbook. I’m newly a fan of zucchini and I’ll take pasta just about anyway I can find it so this was a good match. I already had chicken thawed so I added that and though it bumped up the calories, it was a good addition. 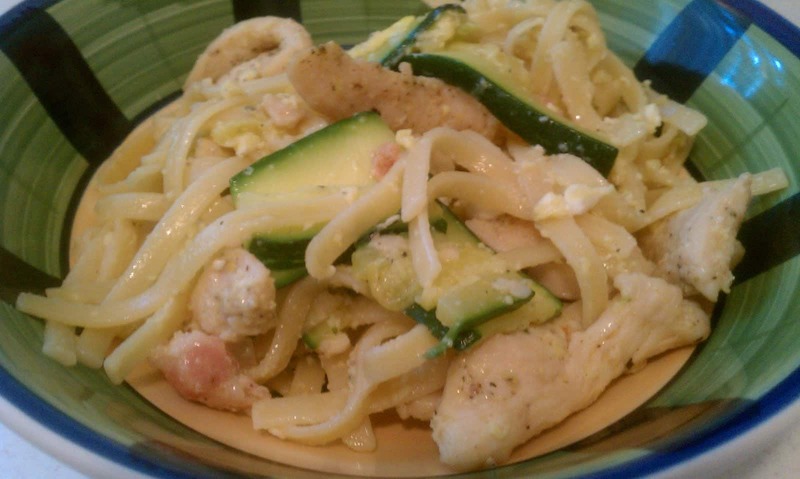 According to the book, without the chicken, this recipe comes in at 370 calories, 8 g fat, 960 mg sodium. Bring a large pot of salted water to boil. Add the pasta and cook until al dente (usually about 30 seconds to a minute less than the package instructions recommend). While the pasta cooks, heat a large saute pan over medium heat. Add the bacon & cook until cripsy, about 5 minutes. Transfer the bacon to a plate lined with paper towels. Discard all but a thin film of the fat from the pan. Add the onion, zucchini and garlic and cook for 5 – 7 minutes, until soft and lightly browned (I added the chicken for about a minute before this step to let it get a head start). Stir back in the bacon and season with a bit of salt and plenty of coarse black pepper. Drain the pasta, using a coffee cup to save a few ounces of the cooking water. Add the pasta directly to the saute pan and toss to coat. Stir in enough of the pasta water so that a thin layer of moisture clings to the noodles. Remove from the heat and crack the two eggs directly into the pasta, using tongs or two forks to toss for even distribution (I left the burner on low and cooked the egg for about a minute – I was weirded out by seeing the raw egg). Divide the pasta among four warm bowls or plates and top with grated cheese & parsley.